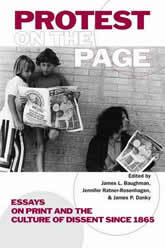 James L. Baughman (Co-editor), James P. Danky (Co-editor), Jennifer Ratner-Rosenhagen (Co-editor). Protest on the Page: Essays on Print and the Culture of Dissent since 1865. University of Wisconsin Press, 2015. The use of print to challenge prevailing ideas and conventions has a long history in American public life. As dissenters in America sought social change, they used print to document, articulate, and disseminate their ideas to others. Protest always begins on the margins, but print is the medium that allows it to reach a larger audience. In Protest on the Page, scholars in multiple disciplines offer ten original essays that examine protest print culture in America since 1865. They explore the surprising range of dissidents who enlisted print in their causes—from vegetarians and anarchists at the advent of the twentieth century, to midcentury evangelicals and tween comic book readers, to GIs and feminists in the 1970s–’80s. Together they demonstrate that print has never been a neutral medium, but rather has been instrumental in shaping the substance of protest and its audiences.